Holy Cross Greek Orthodox School of Theology is committed to diversity and welcomes applicants from all backgrounds and jurisdictions. Qualified students are admitted on a rolling basis for Fall and Spring enrollment. Please contact us even if you have missed one of the deadlines listed below—we will be happy to work with you. Seminarian status is awarded only after the completion of the first year of studies, once a prospective seminarian has demonstrated evidence of a life in Christ with high moral judgment, sound character, and growth in spiritual maturity appropriate to the priestly vocation. 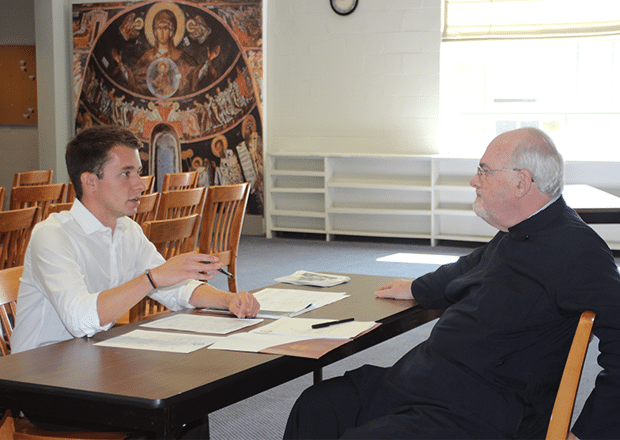 More specific criteria for seminarian status are described in the online catalog and other directives of the School. The completion of a Holy Cross degree does not in itself guarantee ordination. Once application materials are submitted to Holy Cross, they become the permanent possession of Holy Cross and may not be returned to the applicant. *Holy Cross requires a minimum score of 550, 213 for the computer-based testing, or 79-80 for the Internet-based TOEFL. Hellenic College Holy Cross code: 9794. While admission to the School of Theology is holistic, students wishing to transfer credit from regionally accredited theological schools and graduate seminaries must have a 2.5 cumulative grade point average in their previous academic work. Students transferring credit for a course must have earned at least a C grade in the course. Course(s) accepted for transfer must have been eligible for graduate credit in the institution at which they were taken and, preferably, were completed at an institution accredited by a recognized accrediting body. Further, transfer courses should correspond to courses offered by the School of Theology (course descriptions may be requested). Normally, credit is granted for each course that is equivalent to a corresponding course at Holy Cross, provided the grade received was C or above. The Registrar, in conjunction with the Dean, will evaluate whether courses may be counted for credit within a student’s program and will grant all credit deemed appropriate. Transfer credit requiring additional consideration will be reviewed by the Degree, Policies, and Procedures Committee (DPPC) in conjunction with the Dean. Prior to enrollment, students may receive a tentative degree audit provided by the Office of Admissions. Once enrolled, the student will receive a final degree audit provided by the Registrar’s Office. Please see our online catalog for more details on credit transfers. Holy Cross periodically admits students with advanced standing to one of its master’s degree programs. Advanced standing may be granted (1) without credit, by exempting students from some courses but not reducing the total number of academic credits required for the degree, or (2) with credit, by reducing the number of credits required for the degree. Advanced standing refers to decisions about students’ competence when no transcripts of graduate credit are presented. Advanced standing with credit is granted only after appropriate assessment of a student’s knowledge, competence, or skills that would normally be provided by the specific courses for which they have been admitted with advanced standing. Advanced standing with credit cannot be granted on the basis of ministerial or life experience and may not fulfill more than one-fourth of the total credits for a degree program. 1. 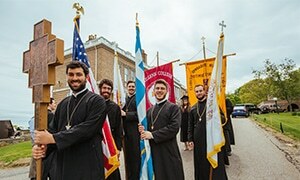 Men who hold the Master of Divinity degree or its equivalent from non-Orthodox theological schools and have received ministerial ordination prior to their reception into the Orthodox Church who wish to be candidates for the holy priesthood in the Greek Orthodox Archdiocese must have at least two years of living experience in a Greek Orthodox parish prior to their acceptance as seminarians of the Greek Orthodox Archdiocese. They must also complete three years of study at Holy Cross. The Holy Cross degree program will be tailored to meet individual needs. The modified course of study will include language courses and will be planned in consultation with the Dean and each candidate’s academic advisor. 2. Candidates who hold advanced degrees (beyond the MDiv) will complete a two-year degree program structured to meet their particular needs for service in the Church. 3. Candidates who hold advanced degrees (MA, PhD) without any theological training will be enrolled in the three- or four-year MDiv degree program. 4. Upon the completion of the degree program, candidates may be required to do additional work abroad in order to strengthen their linguistic abilities and refine their liturgical training. Exchange students are those who are officially registered with other accredited graduate theological schools and seminaries and take one or more courses at Holy Cross, whether for credit or audit. Grades for the courses taken are transmitted to the school in which the student is officially registered. Financial obligations are determined by the protocol between these schools and Holy Cross. The School of Theology accepts a limited number of qualified students as degree candidates on a part-time basis. Tuition is determined on a credit-hour basis. Part-time students must fulfill all admission requirements. In order to receive federal financial aid, part-time students must be registered for a minimum of six credits. As stated above, the completion of a Holy Cross degree does not in itself guarantee ordination. Hellenic College Holy Cross Greek Orthodox School of Theology does not discriminate on the basis of race, creed, gender, sexual orientation, color, national or ethnic origin, marital status, veteran status, religion, age, or disability. We seek to provide opportunities and experiences for all students on an equal basis. Application questions marked as not required are used for summary reporting purposes to ascertain compliance with the college’s guidelines only. These answers are not used as a basis for admission or in any discriminatory manner.